Click HERE to take a look at the Paddywagon EXP 19. The Barkeep DLX 16 is the most feature rich of the Axiom Handlebar Bag lineup. 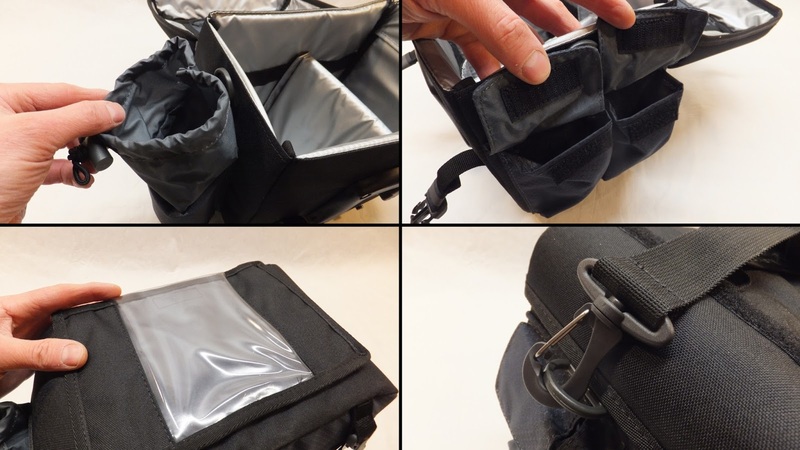 With a retail price of $129.99 this semi-insulated bag has multiple pockets, a clear touch compatible pouch and a quick release mounting system. Although the Barkeep DLX 16 has a smaller capacity than the Paddywagon EXP 19 it is quite larger, mainly because there are no expandable sections. 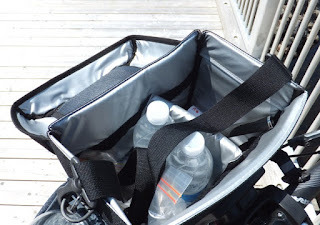 What is does have is a water bottle bag (or feed bag) on the left, a dual chamber pocket with Velcro closure on the right and a mesh pocket on the front. A clear pouch graces the lid and it is suitable for a phone or gps as it is touch compatible. 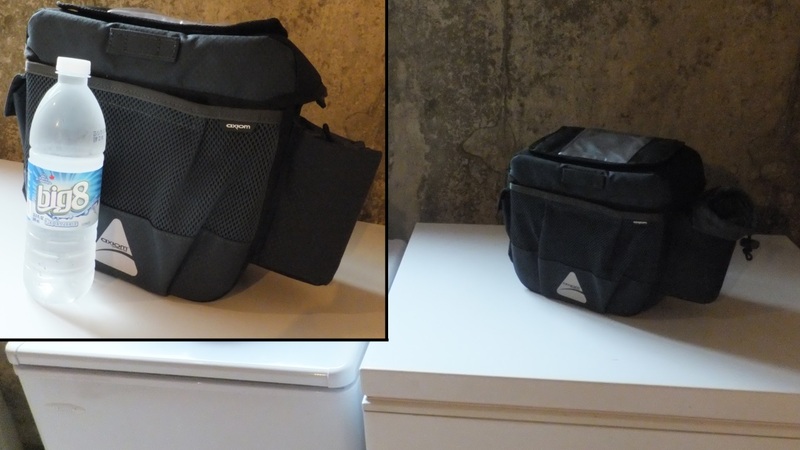 And finally, there are D-rings to attach the shoulder strap and a carrying strap under the cell phone pouch. The Barkeep DLX 16 opens away from the rider so that you do not have to dismount to get at your stuff. The inside is insulated to keep things cool\warm with hidden rigid panels helping the bag maintain its shape. 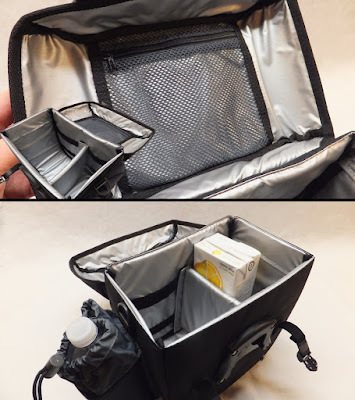 Inside the lid there is a zippered mesh pocket and a huge compartment (with Velcro divider) to store your goodies. 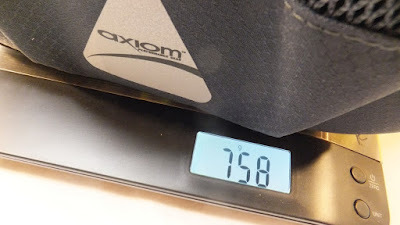 The Barkeep DLX 16 weighs in at 758g which is slightly lighter than the 860g as claimed. The Barkeep DLX 16 gets a matching bright yellow rain cover for when things really get wet. It also has a reflective stripe on the front and four snap closures to secure the elasticized cover to the bag. I’m thinking nothing short of a typhoon will tear off this cover. I ran into a little difficulty installing the bar mount . . . until I found the instructions on the Axiom site. 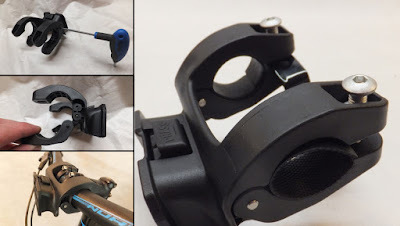 I had initially popped the bar mount over my 31.8mm bars and the clamps would not fit. This was quite odd until I discovered that there were two positions for the lower jaw. Pushing out the pins and relocating the jaw to the hidden lower position, the mount installed as expected. And with that the bag snapped into place very easily. 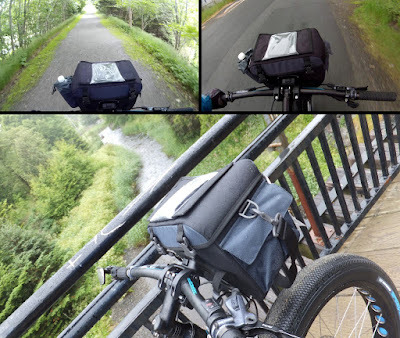 The Barkeep DLX 16 was strapped to the nose of a street based Norco Bigfoot (Fatrod) and an off-trail Norco Sasquatch 6.1 for testing. 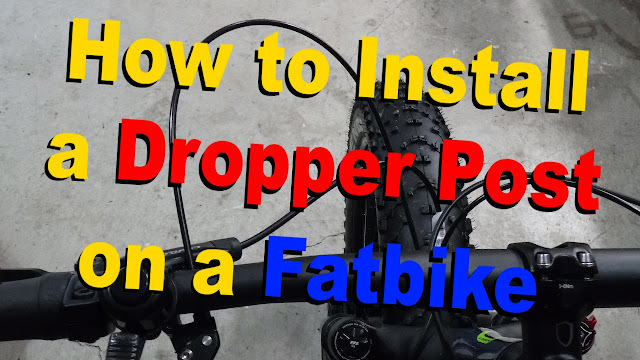 Scooting around on the blacktop and city trails on the Fatrod (with rigid fork) the Barkeep was barely noticeable. 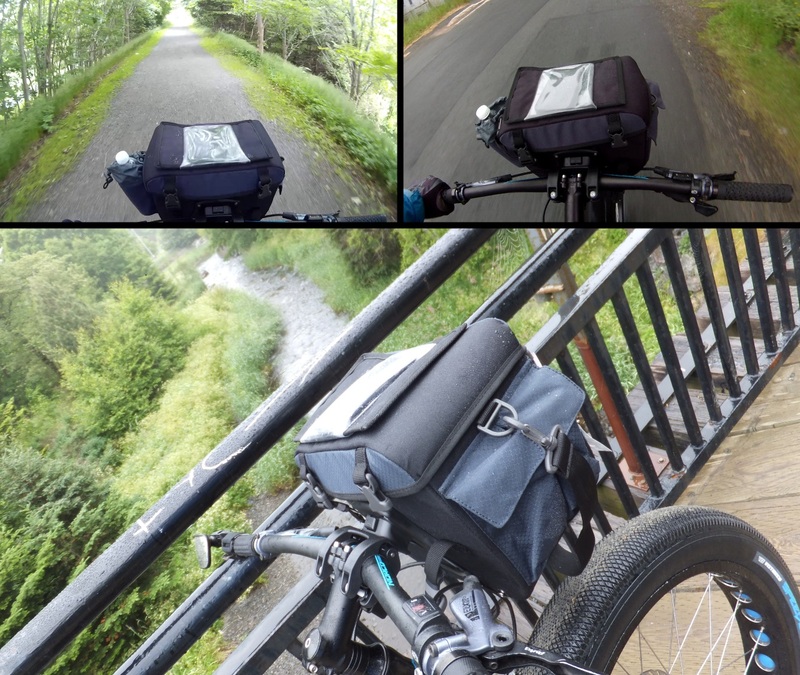 Although it did obstruct the view of the front tire, the higher center of gravity of the packed bag did not have much of an effect on the smooth trails. Heading off the beaten track the Barkeep DLX 16 became more noticeable on the bluto equipped Sasquatch. 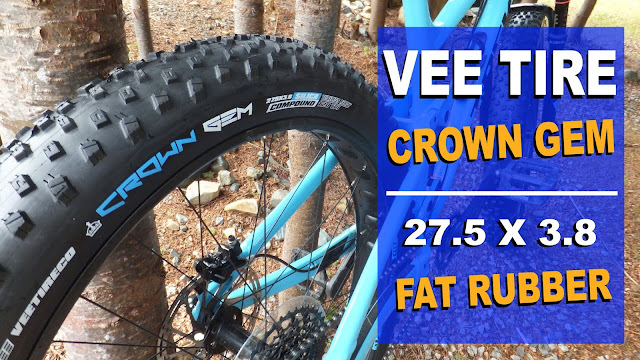 The additional weight on the bars caused the bluto to engage more often when negotiating the humps and bumps. Adding more air to the fork tempered the bluto’s reaction. The higher centre of gravity does require a change in riding style when approaching twisty bits in the trail. The Barkeep did bounce when going over rough sections, however its internal bracing/support allowed it to maintain its shape and the bracket mounted to the bar did not even think about moving or twisting. Whether running the Barkeep DLX 16 on smooth trails or in the back country, it was super convenient to have the extra storage literally at your fingertips. When riding it was actually more convenient to reach for the water bottle attached to the Barkeep than the one attached to the bike frame. It was also much easier to access camera gear instead of trying to wrestle it out of a backpack or shorts pocket. The touch screen friendly pocket on top is great for those who need to be connected. 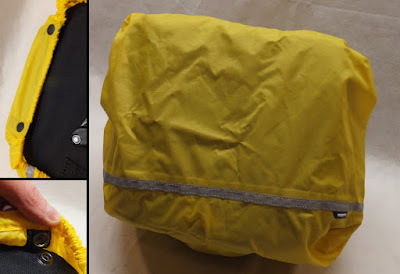 I did encounter heavy drizzle while testing, and while the outside of the bag did get wet, the contents inside (and the phone in the pouch) stayed dry. 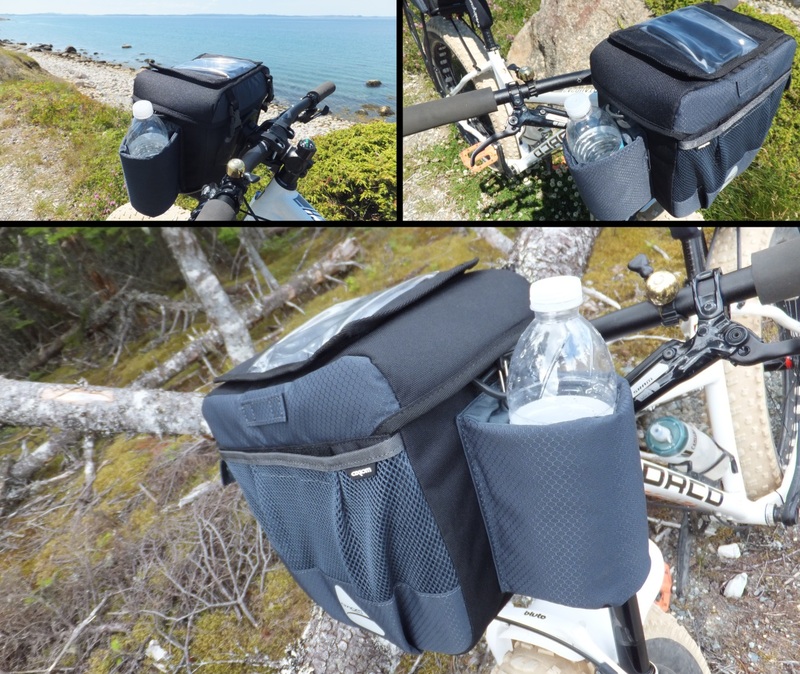 And the quick release bracket allows you to remove the bag from the bar in mere seconds. While not tested in winter conditions, the insulation in the Barkeep DLX 16 does indeed keep water from freezing. I placed a bottle of water into the bag and placed it in a chest freezer for three hours. The water did not freeze . . . it was just cool. 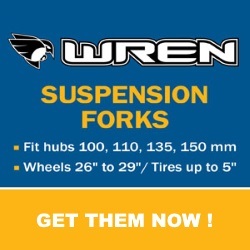 By that token it should also keep other goodies from freezing during winter rides. When closed the lid of the Barkeep fits snugly over the bag opening, extending down the sides about an inch. 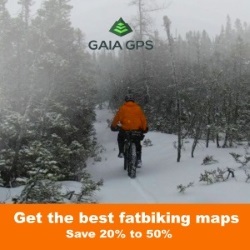 This will keep out any snow during blustery conditions or winter tumbles. 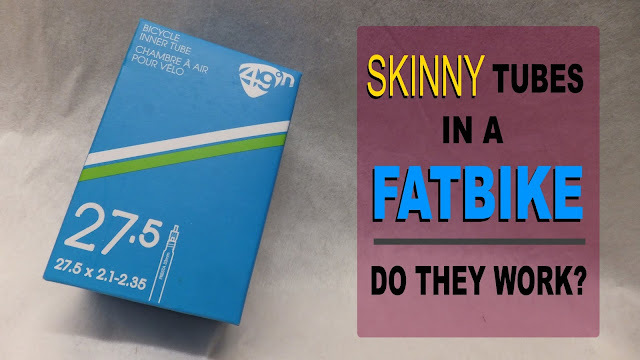 While not a specifically dedicated fatbike product, the Barkeep DLX 16 does have applications in the fat world. While riding in technical twisty and uneven surfaces, especially with front suspension, the Barkeep DLX 16 will require changes to your normal riding style. On smoother trails . . . and undoubtedly during the winter months . . . this is not a concern. Either way the Barkeep DLX 16 does offer fingertip access to a huge amount of storage. The shoulder strap can be attached while mounted to the bike so it can be easily remove and carried on your person. 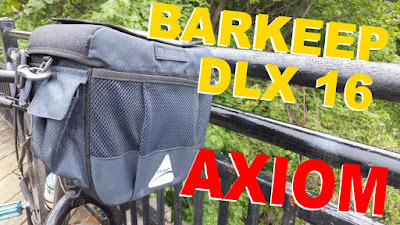 Like its Paddywagon EXP 19 brother, Barkeep DLX 16 is extremely well constructed and the insulating properties of the bag will keep stuff cool during the summer and more importantly . . . from freezing solid during the winter. 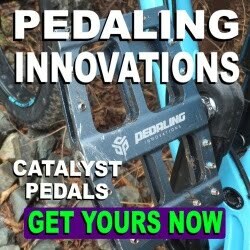 If you want quick access to goodies or gear, head on over to the Axiom site to take a closer look at the Barkeep DLX 16 or visit your favorite on-line retailer or local bike shoppe. There is a tonne of room. The center divider can be moved as well. What are the dimensions and I'll take some measurements.